Its a custom fixture made using a moonlight LED kit from RapidLED. I got the heatsink off Ebay and made the stand using stuff from Home Depot. Appreciate your response. Looking at RapidLED, there are a variety of Moonlight LED kits. As someone with minimal experience, are they functionally different? Consider the reptile tanks with front doors and screen tops. My local shop offers custom glass aquariums with sliding doors and heavy gauge screen tops with a layer of fine screen to keep in fruit flies. Doors are propped open with chopsticks for the zen feel; enough to keep kitty out. Also shop for a 4000K led quantum board to cover most of the top. I have a mix of aquarium led strips over mine, plus some South Sun, and will be customizing a quantum board. The 453nm blue led mini strip evening light attracts mosquitoes, etc. Consider a coffee press terrarium or glass vase. What's that vandaceous orchid? I have one myself and lost the tag. Also... BEAUTIFUL setup! I just noticed this thread - here's actually my desktop terra at work. 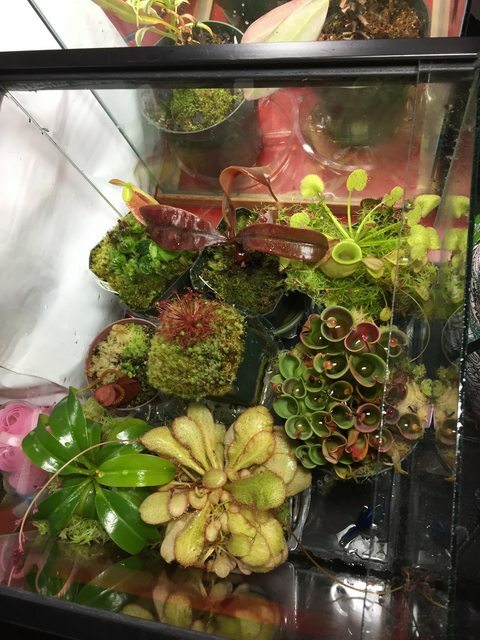 I keep it under a 26W Daylight CFL in a herp light fixture sat directly on top of the glass on top - the top of the cube is like 3/4 piece of glass that slides on and 1/4 mesh netting thing. CFL because I want the heat in the day due to the N.villosa. It's 1'x1' cube and I stand all the plants on smaller pots to elevate them, sat in saucers. The bottom is just flooded with water most of the time due to condensation rolling down the insides of the terra but it's good to keep the humidity constant. I had that white square grating at the bottom for a few years but it gets mucky and hard to clean, which I don't want to show off at work. A local petshop used to make these terras on-site but stopped making them a few years ago.